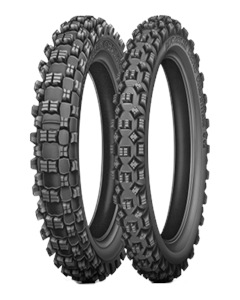 THE muddy/grassy terrain tyre choice for Michelin’s 2012 MX1 and MX2 sponsored riders. 25% extra tyre life* over the MICHELIN S12 thanks to its new high-resistance compound. Superior traction and grip on greasy cross-slopes thanks to its tall 18mm tread blocks and Maximized Contact Patch (MCP) casing.